ANNUAL shareholder meetings may not be the most efficient occasion for managers to meet with the owners of the companies they run — they can be hard for shareholders to get to and are sometimes hijacked by gadflies with personal agendas and long-winded, irrelevant questions. Because most, if not all, shareholders cast their votes before the meetings even take place, they can feel ritualistic and not terribly meaningful. 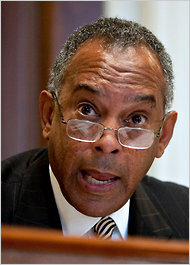 John W. Thompson, chairman of Symantec, held its meeting online. Yet, these congregations do give shareholders a rare opportunity to take the measure of the managers and directors who are supposed to work for them. How executives answer questions that shareholders pitch at them can be very revealing. As long as investors get a chance to ask their questions, of course. Which brings us to a curious phenomenon known as the virtual annual meeting. Given that the Internet has made digital get-togethers ubiquitous, it was only a matter of time before large corporations began suggesting that in-person annual meetings be replaced with online-only gatherings. The benefits are obvious: efficiency and ease of participation, for example. But some investors fear that ether-only meetings will allow managers to hide from shareholders, evade their questions or otherwise dismiss their concerns. And they are pointing to the shareholder meeting last Monday of the Symantec Corporation as an example of why their concerns have merit. Like other technology companies, Symantec has held hybrid annual meetings in recent years — offering both a venue for those who wanted to attend in person and a virtual meeting for everyone else. This year, it decided to go all-virtual and alerted shareholders to the change in proxy materials submitted last month. While other companies have done this, Symantec is the first Fortune 500 corporation to conduct an Internet-only shareholder meeting, according to institutional shareholder groups. Here’s another wrinkle: Unlike other companies that broadcast video along with audio, Symantec held its meeting as audio-only — making it impossible for investors to observe the goings-on or see which Symantec executives had decided to make themselves available. GENEVIEVE HALDEMAN, a Symantec spokeswoman, explained the company’s rationale for all of this. A handful of investors have objected, saying that Symantec’s decision to ask everyone to beam up didn’t really expand the potential audience and that it was wrong to deny investors the ability to meet managers and directors in person. Anne Sheehan, director of corporate governance at Calstrs, a California pension plan, wrote a letter to John W. Thompson, Symantec’s chairman, saying, “We believe it is important that public companies at least annually provide shareholders with the opportunity to meet with the directors who represent them.” The Council of Institutional Investors also indicated its opposition to Symantec’s online-only move. Nevertheless, Symantec went ahead with the virtual meeting. Matters decided at the meeting included the election of 11 directors, approval of KPMG as the company’s auditor, and two management proposals to increase the number of Symantec shares dedicated to an equity incentive plan for employees and a stock purchase plan. All passed handily, the company said. A recorded Webcast of the Symantec event shows that it moved along briskly. The formal part of the meeting — voting on the proposals — lasted about 10 minutes. Then came a lengthy management discussion of the company’s various businesses and results, followed by a question-and-answer period that was supposed to consist of queries presented by shareholders. But Symantec management read and answered only two questions from shareholders. Bruce T. Herbert, chief executive of Newground Social Investment, an investment manager in Seattle whose clients hold Symantec shares, said the company failed to answer a query he placed in the electronic queue. Mr. Herbert also objected to the way Symantec conducted the meeting, saying it provided no chance for shareholders to see questions submitted by others or to follow up on any topics shareholders might have raised. Neither did executives identify who submitted the questions it did decide to read. Indeed, because the Webcast provided no video, shareholders may not have realized that several directors had not bothered to attend the meeting, even virtually. When asked about directors’ attendance, Ms. Haldeman said 8 of the 11 showed up. Symantec’s outside directors are Stephen M. Bennett, former chief executive of Intuit; Michael A. Brown, chairman of Line 6 Inc., a provider of musical instruments, amplifiers and audio gear; William T. Coleman, operating partner at Alsop Louie Partners, a venture fund; Frank E. Dangeard, managing partner at Harcourt, an advisory and investment firm; Geraldine B. Laybourne, founder of Oxygen Media; David L. Mahoney, former co-chief executive at McKesson HBOC Inc., a health care services company; Robert S. Miller, chairman of the American International Group; Daniel H. Schulman, president, the prepaid group at the Sprint Nextel Corporation; and V. Paul Unruh, a former director of Veritas, a company taken over by Symantec. Symantec declined to make any of the directors available for an interview. Other companies have considered moving to online-only meetings and have decided against them. Late last year, Intel explored replacing its hybrid meeting with a virtual version. But when shareholders expressed displeasure with the plan, Intel backtracked. Amy Kircos, an Intel spokeswoman, said her company recognized that local shareholders, including some former employees, liked being able to come to the meeting. She also said that the company acknowledged that if it went virtual-only, other companies that are less committed to good governance might use Intel’s example to justify retreating to opaque, online-only gatherings. Procter & Gamble, the consumer goods company, had also discussed having just a cybermeeting this year. But when shareholders, including two descendants of a company founder, complained, P.& G. retreated. Timothy Smith, a senior vice president at Walden Asset Management, said shareholders should be concerned that virtual meetings might encourage managers and directors to insulate themselves. He also said an online-only policy could unfairly limit access for shareholders who aren’t comfortable using computers or Webcasts. Obviously, electronic communications make many things easier and are a fact of life in corporate America today. How companies can best use advances in online communications to deepen their interactions with shareholders has been the subject of a recent shareholder forum administered by Gary Lutin, an investment banker at Lutin & Company. PARTICIPANTS in the forum have proposed these standards of fairness involving electronic shareholder meetings: a company should provide all shareholders with a reasonable opportunity to ask management questions relating to director elections and other matters to be decided at a meeting; a company should present those questions or views to management publicly so other shareholders can consider them; and, finally, a company should generate responses to these questions from managers or directors so other shareholders can consider them as well. A version of this article appeared in print on September 26, 2010, on page BU1 of the New York edition.